The Easter Rising of 1916 was supposed to be a unifying national symbol; A symbol of the resurrection of Ireland, of its brave fight for independence. As we saw in the first part of this article however, the Rising almost from the start of its official commemoration was, as result of the Civil War of 1922-23, a most contested memory. Republicans argued that that Ireland was not free – being partitioned and in the case of the Free State a Dominion of British Commonwealth. Who could legitimately commemorate 1916 was bitterly contested throughout the 20th century in Ireland. 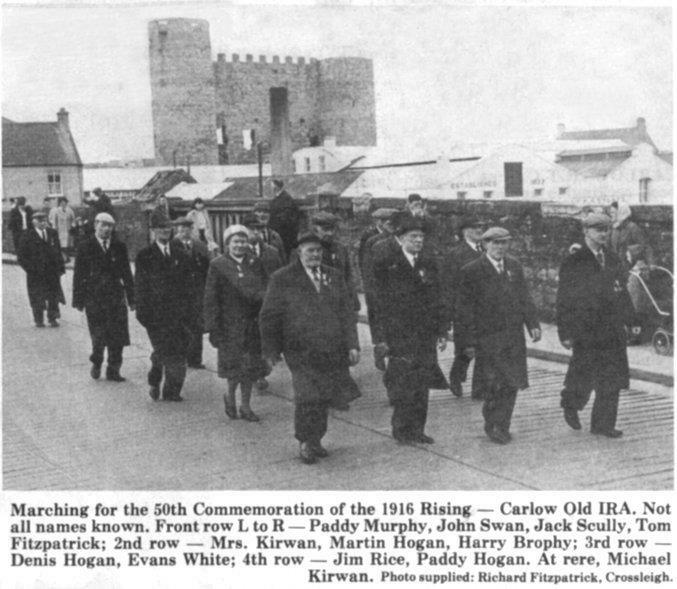 Even after the accession of Fianna Fail to power in 1932, and even after the declaration of the Republic of Ireland in 1948 the remaining IRA continued to use the Rising commemorations as a way of defying both states in Ireland. In the south, both the state and the hard-line Republicans vied for control of the Rising’s memory. In Northern Ireland commemorating the Rising was illegal and every year was the scene of confrontations of some sort between Republicans and the police. What changed everything about the Rising’s commemoration however was the outbreak of fresh armed conflict in the shape of the Northern ‘Troubles’ in 1969. Now the questions posed by the Rising were again urgent; was British rule in Ireland legitimate? Was armed struggle against it justified? By the 1950s, the Easter commemorations in the Republic had settled into a predictable pattern. 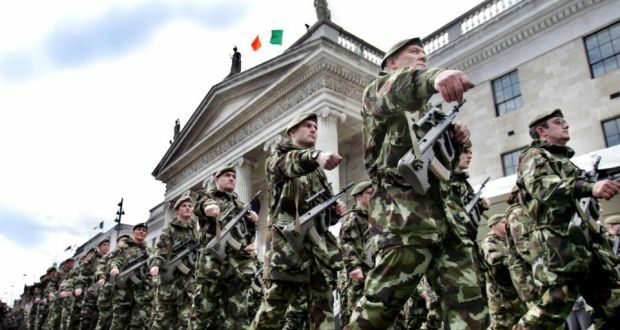 There would be an official military parade by the Irish Army on Easter Sunday down Dublin’s O’Connell Street, followed by a wreath laying ceremony in the cemetery at Arbour Hill. Many of those who led such commemoration in the 1950s and 60s were themselves veterans both of the Rising and the subsequent War of Independence, such as Fianna Fail stalwarts, Frank Aiken, Oscar Traynor and others. Typically, there would also be a separate parade outside the GPO and reading of the proclamation by the IRA or linked groups, who would then march to Glasnevin cemetery. Occasionally the latter parade would be the scene of tension. The IRA was, after all, illegal, and while it had prohibited attacks against ‘26 county forces’ in 1948 it still called for the end of both ‘partitionist’ states in Ireland. The 1966 commemorations breathed new life into the memory of the Rising in the Republic but Sean Lemass was keen for a message of reconciliation to be heard. During the IRA’s border campaign – launched mainly from the south into the North – from 1956-62, several hundred of its members were interned in the Republic. At the 1957 Easter Parade, Sean Cronin the IRA chief of Staff said that there ‘would be no peace until British power in Ireland was completely broken’, and Thomas Doyle of Sinn Fein complained of the arrest of republicans south of the border, saying that ‘Fianna Fail have no mandate to persecute Republicans’. The 1966 fiftieth anniversary provided a new impetus. At this point the southern Irish state had finally turned the economic corner. The nineteen fifties had been a miserable decade, of low economic growth and mass emigration. Sean Lemass (himself a youthful rebel in 1916) upon succeeding another Rising veteran Eamon de Valera as Taoiseach in 1959 had ditched protectionism and economic nationalism in favour of making Ireland an attractive base for foreign companies. Lemass was in many ways a moderniser. While his republican credentials were impeccable, by the 1960s he evinced little nostalgia about the independence struggle of his youth and wanted the 50th anniversary of the Rising to be as much about projecting an image of a new prosperous, moderate, Irish state as celebrating the past. Lemass had cultivated better relations with Northern Ireland Prime Minister Terence O’Neill, exchanging the first official visits between northern and southern states since 1922. He was keen that the Rising Jubilee be about reconciliation as well as celebration of 1916. He praised the ‘magnanimity’ of Britain for returning the ‘Irish Republic’ flag captured during the Rising, expressed respect (unthinkable in his youth) for the Irish soldiers in the British Army in the First World War, who had been motivated by ‘the highest purpose’. Partition he acknowledged, remained unresolved, but he pleaded for a ‘new realism’ that would ‘open up common interests and goals ‘with our ‘brother Irishmen’ in the North. And while it is usually assumed that the Irish state was deeply Catholic at the time, there were actually official prayer services at Catholic, Church of Ireland and Jewish places of worship in remembrance of those who died in the Rising. For all that, 1966 saw a large military parade to commemorate the Rising a huge live action pageant at Croke Park stadium, a ‘children’s’ day’ where the young would learn about the Rising and a parade of 1916 and War of Independence veterans in Dublin and in many other towns around the country. As usual, there were those who felt that 1916 could never belong to the ‘Free State’. Eamon Mac Thomais, head of the rival IRA linked Golden Jubilee committee argued that ‘no one who wanted association with Britain had a right to honour these men [of 1916] ’. An IRA splinter group took the opportunity to blow up Nelson’s Pillar, that provocatively towered over the one time rebel headquarters on Dublin’s O’Connell Street. 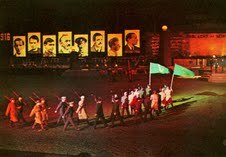 The 1966 commemorations also led to a burst of enthusiasm for re-examining the Rising, particularly the role of James Connolly, in whom many on the left saw an inspirational figure for the social reform of Irish society. Donal Nevin wrote that Connolly’s participation in the Rising ‘is well known, his lifelong commitment to socialism less so’. And even Conor Cruise O’Brien at that time a UN diplomat, thought that the only unfortunate thing about 1916 was that it had not been timed to coincide with the Bolshevik Revolution of the following year or the conscription crisis of 1918 when it might have ‘pierced the heart of the giant’ of European capitalism. In the North remembering the ‘fight for Irish Freedom’ clearly had a different set of meanings. Fighting to remove British rule was not metaphorical in the North, there it could be taken literally. Easter parades were also still a source of serious violence. One of the Belfast IRA’s most famous martyrs, Tom Williams had been hanged in 1942 for shooting an RUC officer in an attempt to divert police resources away from the banned Easter parades in West Belfast. A report of the 1960 parade in Belfast provides a most miserable impression. Some 800 activists, some of them recently released from internment marched to Milltown cemetery, where they said prayers in Irish for the dead, closely watched by the Royal Ulster Constabulary (RUC). Two women were arrested for displaying the Irish tricolour. Even within the nationalist community, purist Republicanism was a minority taste. The 1996 Golden Jubilee of the Rising provoked much tension within Northern Ireland. As in the south, 1966 and the Golden Jubilee re-invigorated the Easter commemorations in the North. Eamon Collins, for instance who was born in South Armagh, and was later a Provisional IRA intelligence officer, recalled visiting Dublin when he was eleven and seeing Pearse’s letters, Connolly’s bloodstained shirt in the National Museum, along with the head of the 17th century Catholic Bishop Oliver Plunkett in Drogheda, ‘in my mind he recalled, Plunkett, Pearse and Connolly were all linked together’. 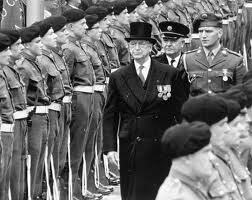 In 1966 he visited Dundalk, just over the border for the state’s Easter parade. ‘I saw lines of marching men carrying banners, tricolours and other symbols that spoke of a heroic Ireland, an Ireland of great deeds, of courage and self-sacrifice… It dawned on me that I was not just looking at a dead history of insurrection, I was looking at an alternative society, government and army’. As part of Northern Ireland Prime Minster Terence O’Neill’s attempt to woo Northern Catholics the Republican parades were allowed to go ahead, preceded by the previously banned tricolour flag. The RUC were deployed in some numbers to provide security. 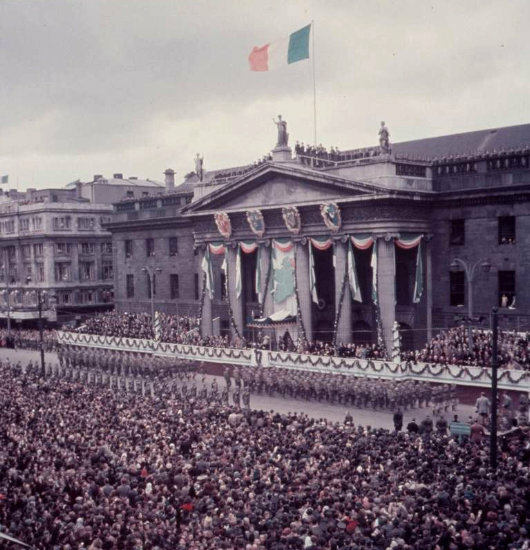 The Irish Times reported that thousands lined the route of the parade and that more tricolours were to be seen than even at the official parade in Dublin. In Belfast the 1966 Easter commemorations produced great tension. Loyalists led by Ian Paisley presumed that the belligerent rhetoric of republicans meant that they were preparing another rebellion. And on the streets of Belfast this could have fatal consequences. Rival parades – the Republicans to the GAA grounds at Casement Park and Paisley’s loyalists to Belfast city centre almost collided on Hamill Street, resulting in nine arrests. The year of the Rising’s fiftieth anniversary came and went however and there was no insurrection. It must have seemed, despite the flurry of anxiety that 1966 caused unionists, as if the symbols of 1916 really were receding into the past. Eamon Collins, the eleven year old from South Armagh who was so enthralled by the 1916 martyrs, acknowledged that had it not been for the outbreak of the conflict in Northern Ireland over Catholic civil rights, he would most likely never have got involved in republican politics. As he approached adulthood, he recalled, ‘I looked to Belfast and London, not Dublin’. It was events on the ground in the North in 1968-69 as the campaign of the Civil Rights Association descended into violence, not the 1966 Easter commemorations that led to the outbreak of civil conflict within Northern Ireland. One of the really fascinating things about the commemoration of the Rising in twentieth century Ireland is how clearly it shows how a state can try to control the understanding of its history. As we have seen, the Republic of Ireland treated the Easter Rising as almost a mundane patriotic anniversary by the late 1960s. If a handful of fanatics insisted on taking its implications literally, no one was particularly upset. However, as soon as blood was again being shed in the name of Irish Freedom – albeit north of the border – what had been the state’s official ideology of ‘soft’ Irish republicanism, was packed up and put away for a day when it was less dangerous to the state’s actual interests. After the outbreak of armed conflict in Northern Ireland in 1969, the southern state cancelled all public military commemorations of 1916. In 1969-1970 as Northern Ireland collapsed into disorder, the Irish state was very nearly drawn into a confrontation with Britain. It had to contemplate sending troops over the border at one stage, in fear of a possible massacre of Northern Catholics and members of the government such as Charles Haughey and Kevin Boland (and almost certainly others) were involved in a scheme to funnel arms to nationalists in the north. A confrontation with Britain was however, in truth the absolute last thing that any Irish government wanted. Britain was not only Ireland’s biggest trading partner (overwhelmingly so before Ireland joined the European Economic Community in 1973), but the Irish currency was also pegged to sterling until 1980. There was free travel between the two countries – allowing Ireland the safety valve of emigration but also easing British investment in Ireland. For all the rhetoric left over from the days of the independence struggle, the Irish state wanted good relations with Britain far more than a united Ireland, which would have included an extremely hostile unionist population. What was more, the republican paramilitary groups, now beginning to operate on both sides of the border posed a direct challenge to southern state forces, at the very least from a law and order perspective, given that their rise saw a spate of bank robberies in the south. So it was that in 1970, the annual military Easter parade was cancelled. The Irish Army would no more parade down Dublin’s main street on Easter Sunday and read the 1916 Proclamation of the Republic. It would, frankly, send out the wrong messages. There were still low-key ceremonies at the cemetery at Arbour Hill to commemorate the executed leaders (a return to the low-key practices of the early 1920s), but that was all. A republican poster from 1976, satirising the description of the IRA as ‘Men of Violence’. 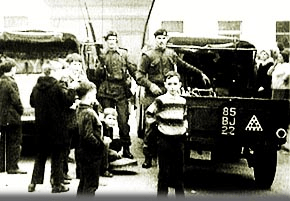 By 1976, the 60th anniversary of the Rising, the southern state and the republican paramilitaries – particularly the Provisional IRA were in frank confrontation. There was nevertheless a rally by Provisional IRA supporters, resulting in some disturbances. The Irish Times reported that some 10,000 people attended the banned rally, which marched from Stephen’s Green to O’Connell Street. A line of blue helmeted Gardai (police) was present and armed troops were on stand by should violence break out. While the rally was mostly peaceful, there were scuffles between Gardai and protesters. Daithi O Conaill of Sinn Fein told the crowd to ‘put your faith in the Provos [P. IRA] and Ireland will be free’. On the 60th anniversary of the Rising in 1976, the Easter parade in Dublin was banned under the Offences Against the State Act. In the North the republican Easter commemorations remained just about legal but were, for obvious reasons, even more fraught than in the Republic. There, Republican Easter parades typically involved a march to Milltown cemetery in Belfast or cemeteries elsewhere where the growing list of Republican dead, from 1916 to the present were buried. Typically British Army helicopters would fly low overhead and RUC Special Branch officers would watch at a discrete distance at Easter parades. But the tension was not only a result of its backdrop of armed conflict with state forces. 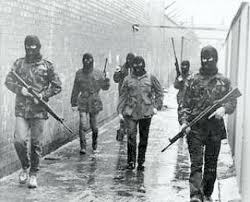 The Rising’s legacy was also fought over by rival armed Republican groups – principally the Official and Provisional IRAs, who had parted company in 1970. Both claimed to be the true inheritors of the rising of 1916. 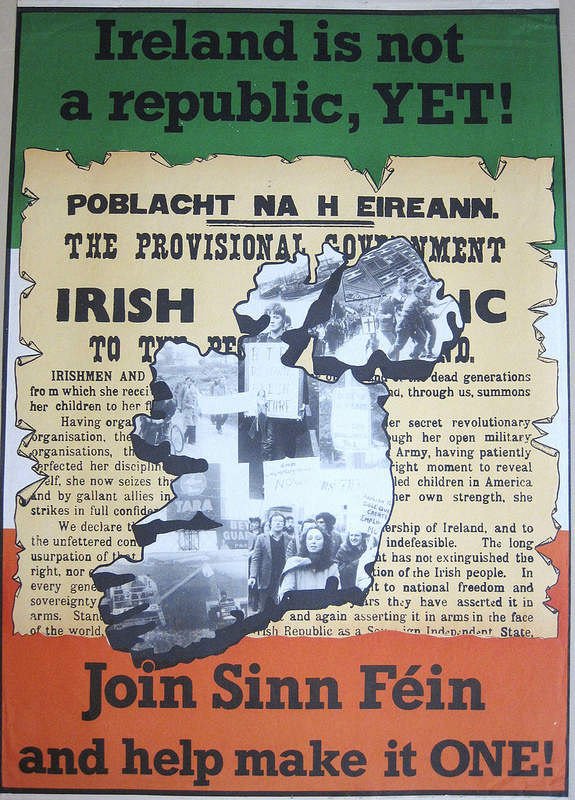 A Sinn Fein poster from the 1970s invokes the proclamation of 1916. For the Provisionals this was quite a straightforward message. As the rebels of 1916 had made war on the British, so would they, until the British left all of Ireland for good. That they were a minority was of no importance. So were the men of 1916, but the people had eventually followed their bold example and expelled Britain from the 26 counties. The 1976 commemorations came at a time of an IRA ceasefire when some believed the British were preparing to withdraw. At Newry in 1976 2,000 participants in the Easter Parade were led by a Provisional IRA colour party, dressed in dark glass and berets. They were told by Anthony O’Malley-Day of Sinn Fein that, ‘we want the British Army out of Ireland immediately but if they want to arranged a phased and orderly withdrawal that can be arranged’. He denounced the ‘Quislings’ in the southern government who, ‘have thrown the banners of the men of 1916 into the dust’. ‘They must bear the brunt of our disdain’. The Officals, attempting to pursue a more leftist strategy tried to take more subtle lessons from the legacy of 1916. They lauded the role of James Connolly and the non-sectarian dimensions of the Rising. Sean Garland told about 1,000 listeners at Milltown cemetery in Belfast at the Official IRA Easter commemoration in 1976 that they were acting under the inspiration of ‘Tone, Davitt, Pearse and Connolly’, that ‘an economic programme was essential’ and that ‘political activity was the best way to achieve this’. Such, it could be argued, was the bitter fruit of the Easter Rising. Provisional IRA members in Belfast, 1980s. Throughout the 1980s and much of the 1990s, the commemoration of the Rising was essentially left to militant Republican groups. There were some attempts to ban or restrict republican Easter parades in the North. In 1987, Gerry Adams swore that republicans would defy any attempts to make ‘traditional’ Easter Parades illegal. In 1991, the 75th anniversary of the Rising, there were effectively no official state commemorations in the south apart from a muted ceremony outside the GPO. The message was now too poisonous after two decades of intermittent political violence in the North. In 1991, the 75th anniversary of the Rising, there were effectively no official state commemorations in the south. 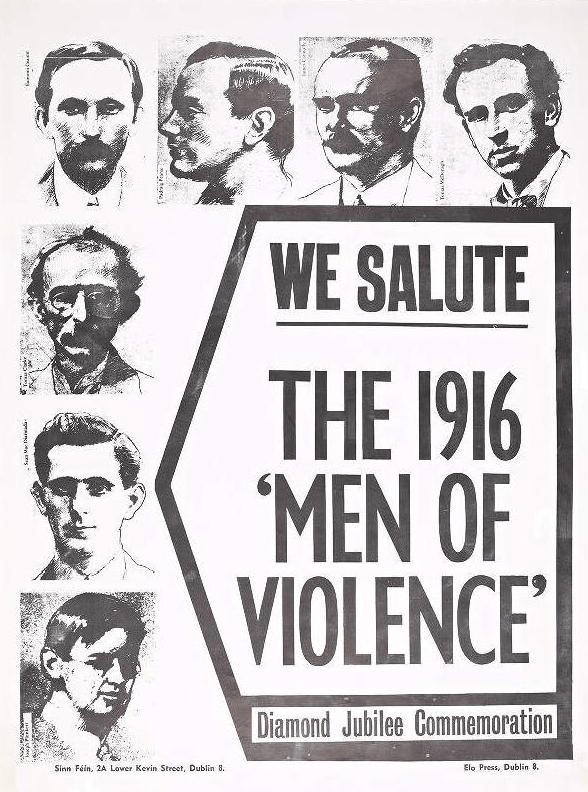 The Irish state did not disown the Rising – in general the official message was that the modern Provisional IRA had disgraced the noble memory of the men of 1916 by their targeting of civilians and cowardly ‘terrorism’. But the state was by no means keen to encourage the emulation of the 1916 insurgents – a minority of armed activists who had led the majority towards independence by use of force. It was far too close to the message of the Provisional IRA, whose campaign seemed to be grinding on interminably in Northern Ireland. And in truth, there was also at this juncture, little public appetite for celebrating the Republican tradition in the south. Not only was the public generally hostile to armed struggle by this time –there were for instance large protests against IRA bombing of civilian targets – but it was also unfashionable. There was a yearning for modernity, for a shaking off of the old traditions, which characterised the 1990s in the Republic. It was decade when the votes for the traditional political parties – Fianna Fail and Fine Gael -fell sharply, when homosexuality, divorce and contraception were made legal, when attendance at religious service plummeted. If the myth of the 1916 Rising had a future, it would have to be re-invented for a new generation. Irish Army troops at the 2006 parade. The new millennium brought two important new developments which changed the context of commemoration of the Rising again. One was the peace process that finally ended the Northern Ireland conflict – first with IRA ceasefire of 1994 and conclusively with the Good Friday Agreement of 1998. The other was the so-called ‘Celtic Tiger’ economic boom which, very rapidly made the Republic of Ireland an unqualified economic success for the first time. Both of these factors allowed for a new burst of Easter commemorations. Now the Rising was no longer directly associated with ongoing violence north of the border. Equally significantly the Irish state born (indirectly) out of the Rising could finally be depicted as having realised some of the 1916 leaders’ dreams. In 2006 the revival of the military parade in the south was a reflection of the Irish state’s new-found confidence and of the new stability brought on by the Northern peace process. In 2006 Fianna Fail Taoiseach Bertie Ahern re-instituted the military parade on Easter Sunday. While some were uncomfortable with the return of public displays of militarism, the response from the public was generally welcoming. In some ways it was a return to Sean Lemass’s attempt to integrate the Republican tradition into the mainstream in 1966. 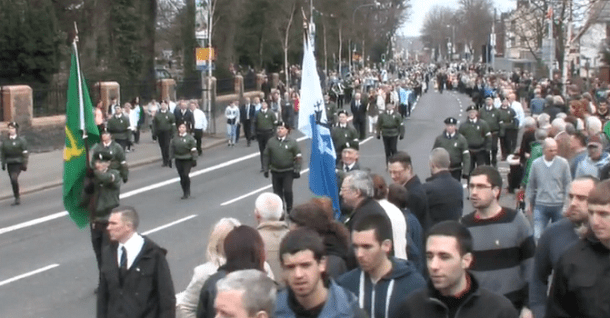 Belfast republicans march at Easter 2015. It was also a transparent attempt to keep the mythology of the insurrection out of the hands of the (Provisional) Republican movement, now rapidly gaining in popularity south of the border. This year, the centenary of the Rising, we will see many of the contradictory elements of the public memory of the Easter rebellion. The Irish state will commemorate it to assert its ownership over the event, but will strive hard for a message of ‘reconciliation’. The Republicans of Sinn Fein will stake their claim, emphasising the continuity of the independence struggle with their own armed struggle in the North. But they too will have an essentially pacific message – ‘we should be proud of our heroes but the time for fighting is over’. In Northern Ireland, 1916 retains the power to divide, but one hopes, the commemorations will be nowhere near as fraught as in 1966. Only a few, now a very few, so called ‘Dissident’ Republicans will still use the Rising as a blueprint for the future – the first shots of a still unfinished war. But for the Irish public at large, the Rising commemoration will be something much simpler – a chance to feel proud of their country and its history and way to express their hopes for its future. https://treasonfelony.wordpress.com/tag/tom-williams/ Many republicans insist that Williams did not fire the fatal shots that day however. Written by: John_Dorney on 19 February, 2016.on 25 March, 2016.